Monsanto and Terminator Seeds Monsanto is a corporation which specializes in creating GMO (genetically modified organism) technology and genetically altering seeds, especially soy, to improve the crop yield. Their "terminator seeds" are modified to only last one generation to ensure that farmers have to annually purchase new seeds from the organization. This method poses an environmental concern being that it significantly reduces crop diversity and introduces many GMOs into the earth. 3.1 Threat to the Environment? 3.3 Layering Perspectives: Additional Costs and Implications? 4.1 Fighting against Monsanto and using local methods/seeds. 4.2 Use off- patent seeds. In March 1998, Delta and Land Pine Company of Scott, Mississippi received the patent for the genetically engineered terminator seed. This seed prohibits the natural evolution of the crops from occurring, and instead stop the growth process of the seeds’ second generation before they can mature. Monsanto claims the terminator seed would solve the problem they created of genetically modified crops contaminating neighbouring crops. Fear quickly arose from this announcement, and later became a governmental concern once giant agricultural biotechnology corporation, Monsanto acquired Delta and Land Pine Company – mastermind behind the feared terminator seed. 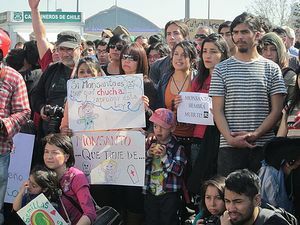 Although Monsanto pledged to not commercialize the seed, tensions grew between chemical, seed and biotechnological companies; meanwhile movements against the terminator seed were led by consumers, environmentalist and sustainable development activists. Monsanto claims the terminator seed would solve the problem they created of genetically modified crops contaminating neighbouring crops. These genetically modified seeds have little benefits to the farmers. Those who are in advantage are the seed companies. The seed prevents farmers from re-planting seeds throughout the seasons by producing a sterile seed, which is unable to reproduce. This forces the farmer to turn to commercial seeds, profiting the large corporations and “creating greater dependency on proprietary seeds and their companion chemicals”. Another advantage would be the improvements for monopoly seed pricing decreasing price discrimination between farmers. But this again benefits the seed corporations as well, by paying farmers equally, with no risk of paying a farmer who reuses their seeds (less expensive for the farmer) the same as a farmer who does not. Aggressive marketing schemes target uneducated farmers, unable to see through the scientific claims being promoted by the major agrochemical corporations. The introduction of the terminator seed means the traditional method of saving seeds for certain environmental conditions is obsolete. Without a farmer’s ability to alter their seeds as environmental conditions change, their resources will deplete. Those who can’t afford to replace seeds seasonally, such as those in developing countries, are greatly impacted by the disposability of the terminator seed. Poorer farmers of the tropics and sub-tropics produce 15-20 percent of the world’s food, and encourage genetic diversity in plant breeding. Not only are the farmers at a loss, but also the population’s food security. Even for the better off farmers of developing countries are at risk, as the need to re-purchase seeds increase costs and control through licensing agreements, leaving the resource-poor farmers to “los[e] their ability to determine their own lives – transforming them to meet the demand of their new masters”. This isolates farmers from the corporations, harming their much-needed relationship. The terminator seed has the ability to decrease crop diversity, pollinate nearby crops with the sterile gene, as well as wipe out agricultural populations, leading the debate to a question of ethics. Although the seeds are intended for the use of already genetically modified, if disease strikes within the crop, it can wipe out the entire field. This negatively impacts the farmer, the species and the population that relies on the farm’s outputs. With the reduction of feasible crops because of terminator seed complications within developing countries means the dependency on developed countries. This reliance produces severe marginalization and “diminution of its powers of self-determination”. While major corporations argue the need for technological advancements and control in agriculture to cater to the world’s food demand, organizations counter argue that this can only be achieved through common ownership, biodiversity and ecosystem conscious approaches. Terminator technology makes it impossible for farmers to use their traditional right to save the seed of their harvest for planting in the next crop season. Not only is this immoral by Monsanto, but also has the potential to ruin a farmer's crop yield if the seeds that must now be planted are defective. This increases spending as farmers now have to buy seeds yearly from suppliers, and also inhibits farmers from breeding newer, stronger and more locally adapted varieties of seeds. This is harmful financially to resource-poor farmers who cannot afford to pay for annual seeds but have been trapped by Monsanto marketing. Biodiversity is damaged when the sterilization of genes occur because it is then impossible for those exact genes to be reproduced. An ecological risk given by terminator seeds is the the possibility of pollen movement during the first generation of terminator seed cultivation. This would cause cross contamination, and the local seeds would become sterile as well. This poses the threat that farmers will not know if their crops have been contaminated, generating potential for economical and food security problems. With an issue as controversial and high profile as that of commercializing the genetically engineered terminator seeds, it becomes all the more important to critically evaluate the information being provided: who is supporting the issue, and who is against it? What is the evidence provided to support their claim? What implicit bias is present, and what does each party stand to lose or gain? As previously noted, the key stakeholders in this particular issue include Monsanto (and companies owned by Monsanto), farmers, and non-government organizations (NGOs). Monsanto’s main motivation to create and commercialize terminator seeds is, unsurprisingly, economic. Melvin J. Oliver, a molecular biologist with the United States Department of Agriculture and primary inventor of the biotechnology, expressed in 1998 that the main goal of creating the seeds is to “protect” US agriculture, and make the US competitive on the global stage. With this motive abundantly clear, it makes Monsanto’s claim that the seeds cause no environmental harm a difficult statement to substantiate. Monsanto claims that the genetic seed sterilization actually provides enhanced safety to the wild relative crops nearby, as the seeds produced from unwanted pollination would not germinate with the terminator seed technology. However, these statements and “facts” were released by the USDA – who, at the time, jointly held the terminator seed patent with Monsanto. In addition to the conflict of interest, the “facts” regarding the seeds have not been confirmed through any research. Furthermore, critics such as molecular biologist Martha Crouch of the University of India are quick to point out that, under certain conditions, the sterility from the terminator crop could spread via pollination to surrounding plants and make those plants sterile as well. Further questions from critics include important issues, such as: will the terminator gene mutate and change characteristics in some dangerous way? Will the seeds containing the toxin that sterilizes them pose health threats to humans? Will the antibiotics used in the process harm or alter the environment, and the humans consuming them? Ultimately, the developers of the terminator seeds maintain that these concerns are groundless. However, without sufficient research to confirm the benign nature of these seeds, the reassurance remains unconfirmed . Layering Perspectives: Additional Costs and Implications? What other costs and/or implications become apparent when the use of Monsanto's genetically modified terminator seeds is viewed through the lens of other disciplines and professions? What special expertise, resources, or theoretical orientations might others bring to help us better understand the costs and/or implications associated with the use of Monsanto's terminator seeds? It is highly unlike if not impossible for there to be a remedial action which would benefit all actors regarding this issue, being that the values of opposing sides are so different, but there are solutions which can help at least one member. Fighting against Monsanto and using local methods/seeds. An action that would benefit both farmers and farming communities is inhibiting the use of Monsanto technology, and alternatively using local technology and growing techniques. This method has already been adopted by many farmers in the Philippines, where the community has been fighting back against corporations, such as Monsanto, and relying on their own seeds and procedures. MASIPAG, a farmer-led network of people’s organizations of NGOs and scientists based in the Philippines, depend on more natural and organic matters, rather than the synthetic pesticides and herbicides which companies sell . This procedure would improve the livelihoods of the farmers and their communities, as well as allow for a self-sustaining economy rather than one reliant on buying new seeds from Monsanto annually. By removing themselves from Monsanto and its procedures, farming communities can dispose of the financial, political and cultural strain they experience. Farmers would be able to customize their own crops and techniques by integrating cultural practices and using seeds which are well suited for the specific environments. This will reduce the harm that is done on the soil, environment and the health of the people. If these local actions are taken the crop yield should be successful and, through the help on organizations such as MASIPAG, there would be no need to depend on GMOs in order to achieve enough growth. Economically and financially this solution makes sense as well, because if the crops are able to grow well without the use of terminator seeds, the farmers don't have to pay for the seeds every year yet still achieve profit from their crops to support their livelihoods. Furthermore, by supporting local seed companies, communities are able to improve their own economy from within instead of living in poverty and continuously buying from larger companies. Finally, by agreeing to local methods rather than Monsanto farming communities maintain their freedom and independence. A risk to this action for farmers is the chance that initially their crops may not be as successful as with the use of Terminator seeds, although by adjusting their methods and improving their scientific methods this issue should be locally resolved. "It has been 20 years since Monsanto developed its first genetically modified crops. Now, some of its early patents are starting to expire which is leading to the first "generic GMOs" off-patent seeds that cost half as much and which farmers are free to save and replant." . The main benefit of this solution is removing the monopoly and power Monsanto currently has. This action would allow farmers to buy genetic seeds with the same technology Monsanto used to use only for half the price and with the capability to save seeds from year to year, to produce . Financially this is a huge advantage for farmers, being that they could save money but the seeds being used are still negatively impactful to the environment and contain the same technology Monsanto used to use. The solution to use off-patent seeds instead of Terminator seeds is a more recent resolution to the issue of Monsanto's seeds, but comes with its own disadvantages. The genetically altered seeds can still be dispersed via wind and contaminate the soil, therefore when considering this action it is important to remember is doesn't improve the health of the environment but increases the financial and political situations for farmers. While the world understands the increase in food demand and the possibility of technology being the answer to this demand, biotechnological companies appropriate such needs. Terminator technology not only affects farmers, but the population which they feed, which could scale from a developing village to the world’s demands. This is why the terminator seed is contested throughout academics, activists and citizens, and seems to solely be supported by its owner: Monsanto. ↑ Menon, Subhadra. "TERMINATOR SEED." India Today (August 3, 1998). Factiva. ↑ Los, Fraser. 2006. The terminator. Alternatives Journal 32 (3); 24. ↑ Shand, Hope. 1998. "Terminator Seeds: Monsanto Moves to Tighten its Grip on Global Agriculture." Multinational Monitor 19 (11): 13-16. http://ezproxy.library.ubc.ca/login?url=http://search.proquest.com.ezproxy.library.ubc.ca/docview/208880062?accountid=14656. ↑ Fischer III, William W. "The Impact of “Terminator Gene” Technologies on Developing Countries." United Kingdom Department for International Development (December 1999). ↑ Los, F. (08/01/2006). Alternatives journal (waterloo): The terminator: The next extreme in GMO could undo 10,000 years of traditional agriculture Faculty of Environmental Studies, University of Waterloo. ↑ Visser, B., van der Meer, I., Louwaars, N., Beekwilder, J., & Eaton, D. (2001). The impact of terminator technology. Biotechnology and Development Monitor, 48, 9-12. ↑ Marvier, M., & Van Acker, R. (03/01/2005). Frontiers in ecology and the environment: Can crop transgenes be kept on a leash?. 93-100.